For centuries, Benedetto Pistrucci’s Saint George and the Dragon has graced the British Gold Sovereign, an internationally recognized symbol of British wealth and power. 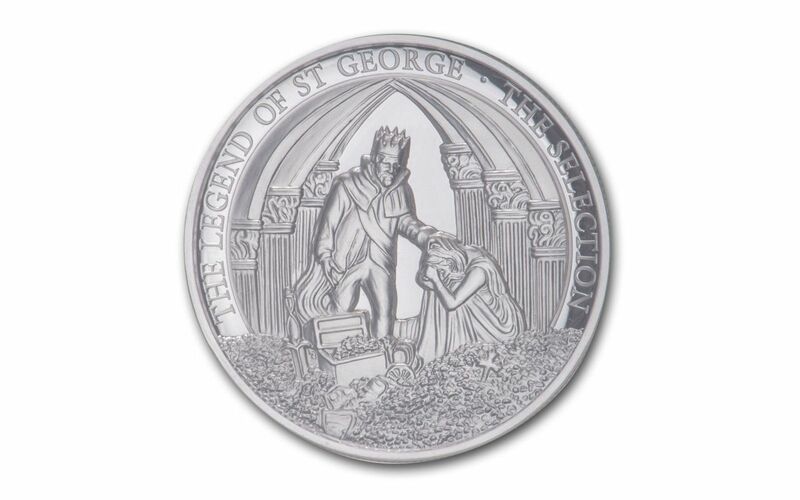 Recently, his descendent and former London Mint Chief Medalist Angela Pistrucci updated that design for the Sovereign’s 200th anniversary. Now the modern Pistrucci is at it again, bringing us a new five-coin series telling the full story of Saint George versus the Dragon! 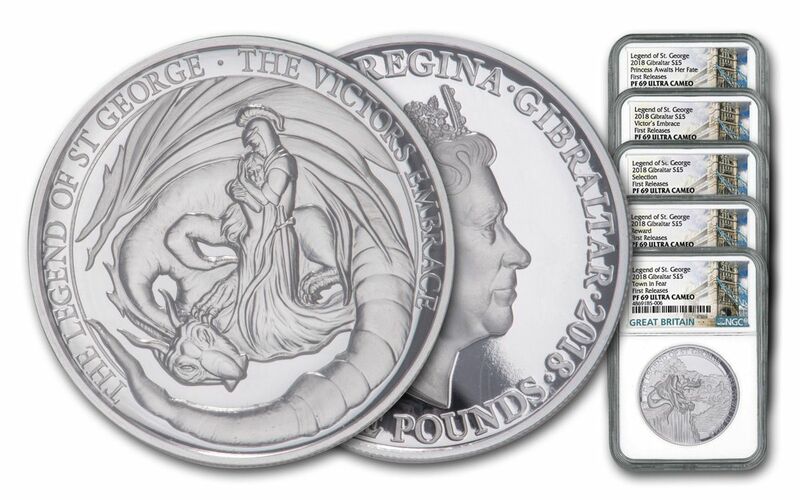 Each two-ounce, 99.9% fine silver high-relief Piedfort proof depicts a different part of the famous knight’s tale – “The Town in Fear,” “The Selection,” “The Princess Awaits Her Fate,” “The Victor’s Embrace,” and “The Reward.” Each double-thick Piedfort proof also comes graded by the Numismatic Guaranty Corporation (NGC) as being in near-perfect Proof-69 Ultra Cameo (PF69UC) condition, a distinction that means your almost-flawless coin will showcase an impressive full strike and indistinguishable imperfections – well above and beyond the quality of the vast majority of coins in the series. In addition, NGC has also certified that these proofs are First Releases (FR), a designation that means these coins were received by NGC or an NGC-approved depository within the first 30 days of their release. Collectors seek out these coins because they are produced with new dies and considered to have sharper strikes and deeper mirrors than those that are struck later. Also, the population of coins labeled First Releases is only a fraction of the total mintage. 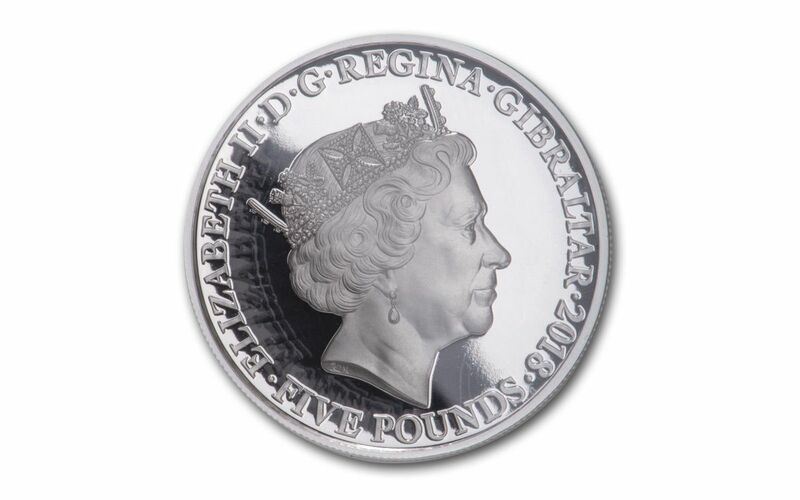 The combination of the razor-sharp details and gleaming silver are perfectly matched on these impressive legal-tender £5 coins! 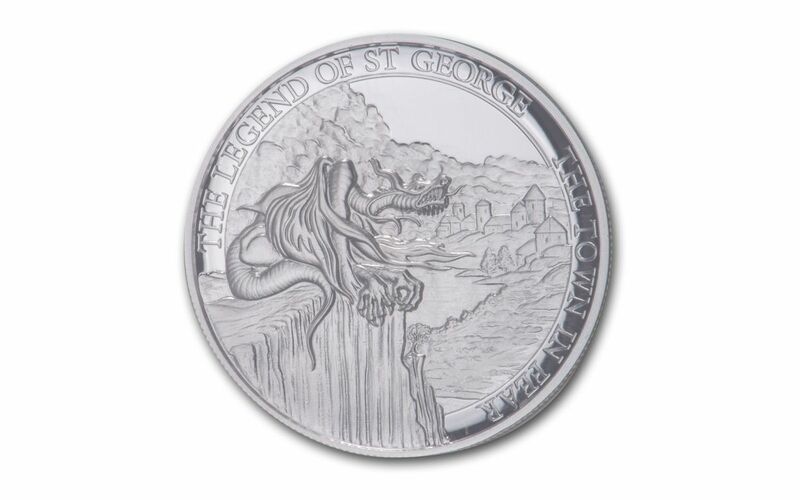 And as if you needed more incentive, you’ll also receive a bonus sixth coin: the 2018 Gibraltar Legend of Saint George One-Ounce Silver High-Relief Coin. It’s modern version of Saint George that was also designed by Angela Pistrucci. It shows the patron saint of England raising his shield as his horse rears up, ready to race into action. The legend reads “THE LEGEND OF ST GEORGE • HONOUR • COURAGE • KINDNESS.” It’s a beautiful piece, and it’s yours at no extra charge! This series is a fitting tribute and continuation of the Pistrucci legend. And though only 1,500 sets were struck, you have a chance to secure yours now before they vanish forever! 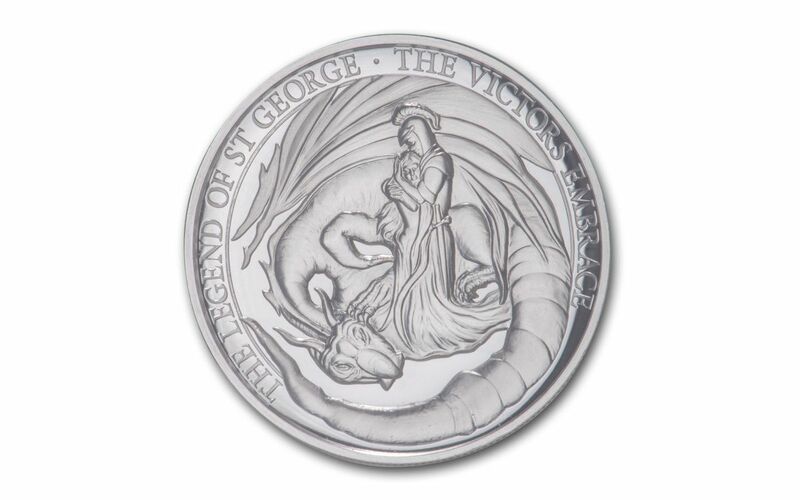 NEW SAINT GEORGE DESIGNS BY PISTRUCCI DESCENDANT– The exciting designs of Saint George were crafted by Angela Pistrucci, the great-great-great niece of Benedetto Pistrucci, who created the original Saint George and the Dragon design on the 1817 Gold Sovereign. Her series of designs tell the full story of Saint George versus the Dragon. The common obverse of each coin features Raphael Maklouf’s traditional portrait of Queen Elizabeth II. 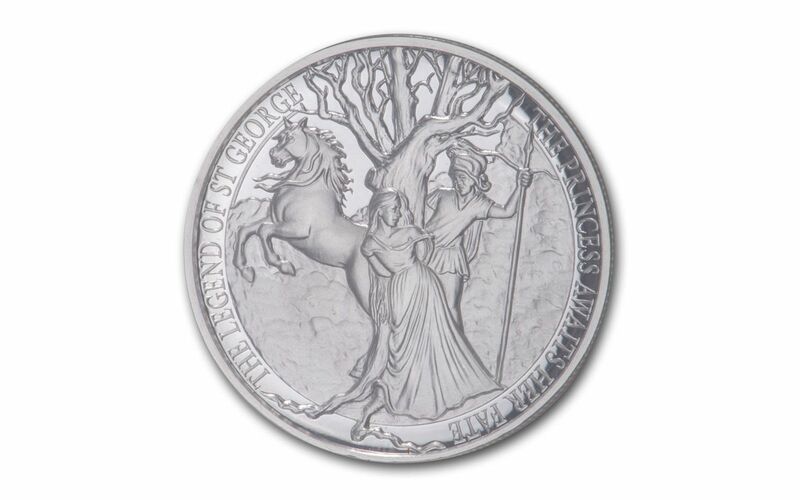 STRUCK IN HIGHLY-PURE SILVER – Each Legend of Saint George Silver High-Relief Coins was struck in two ounces of highly-pure 99.9% silver. 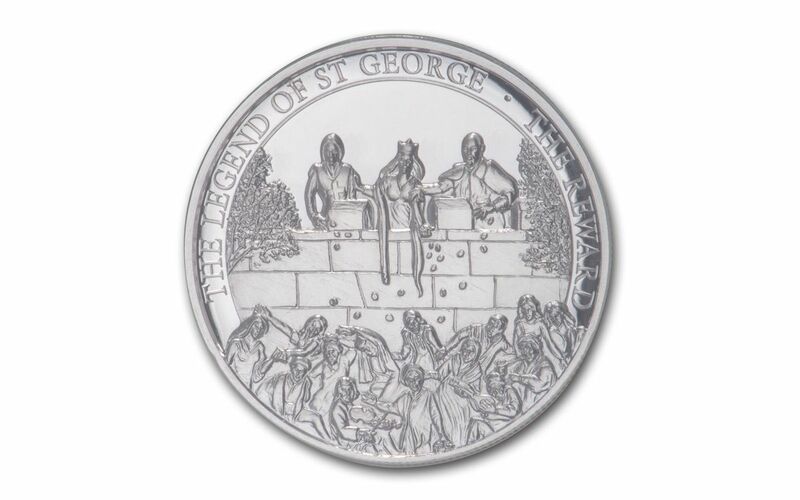 LEGAL TENDER IN GIBRALTAR – These Legend of Saint George Two-Ounce Silver High-Relief Coins are £5 (five pounds) legal tender in Gibraltar. 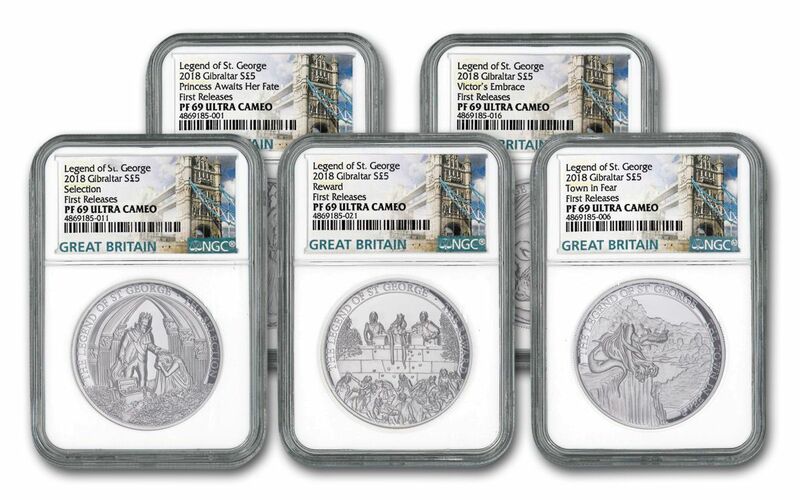 GRADED IN NEAR-PERFECT PROOF CONDITION – Your 2018 Gibraltar Legends of Saint George High Relief Piedfort 5-Piece Two-Ounce Silver Proof Set has been graded by the Numismatic Guaranty Corporation (NGC) as being in near-perfect Proof-69 Ultra Cameo (PF69UC) condition. KEY FIRST RELEASES CERTIFICATION – NGC has graded your proofs to be a First Releases (FR) coins, a designation that means they were received by NGC or an NGC-approved depository within the first 30 days of their release. LOW LIMITED EDITION – The maximum worldwide edition limit for this five-piece proof set has been set at just 1,500. 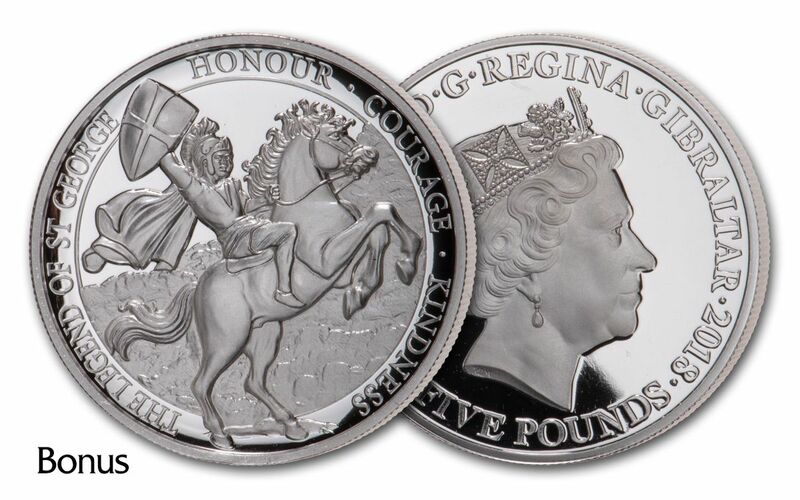 INLCUDES BONUS 0NE-OUNCE COIN – As an added bonus, this set includes the 2018 Gibraltar Legend of Saint George One-Ounce Silver High-Relief Coin also designed by Angela Pistrucci. The Pistrucci legacy continues with this gorgeous proof set. Fall under the spell of Saint George and the Dragon all over again and add this superb set to your collection. Click it to your cart today!